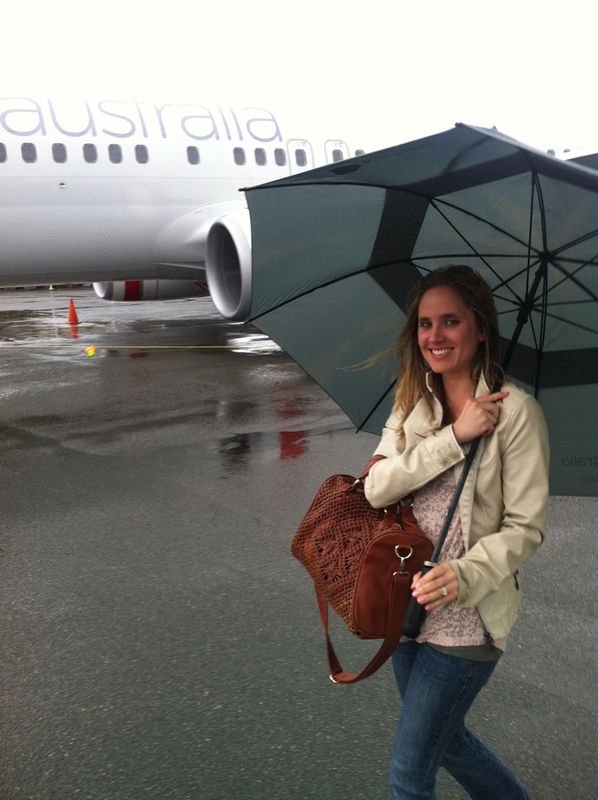 We leave Sydney, Australia with the sun shining as we board a Jetstar flight on our way to the Whitsunday Islands. 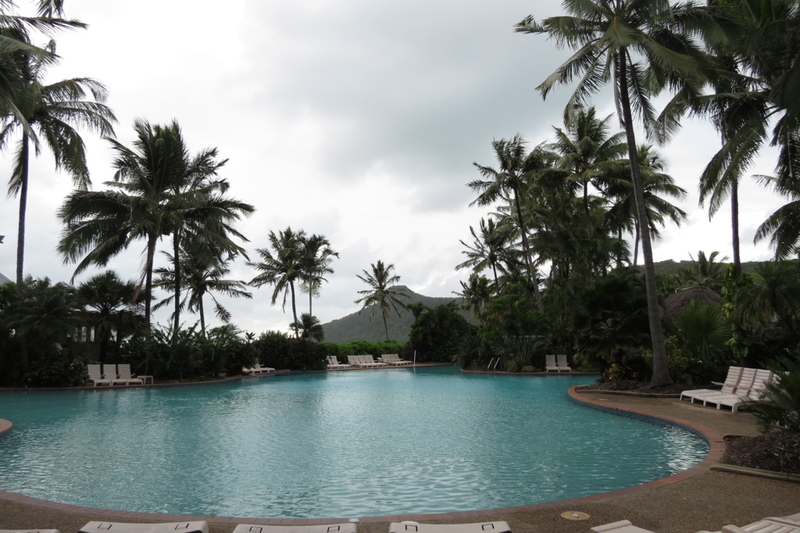 We planned to make a trip to the Great Barrier Reef on our tour of Australia and we were told that Hamilton Island and Airlie beach will give us access without heading any further up the coast as our time is limited. 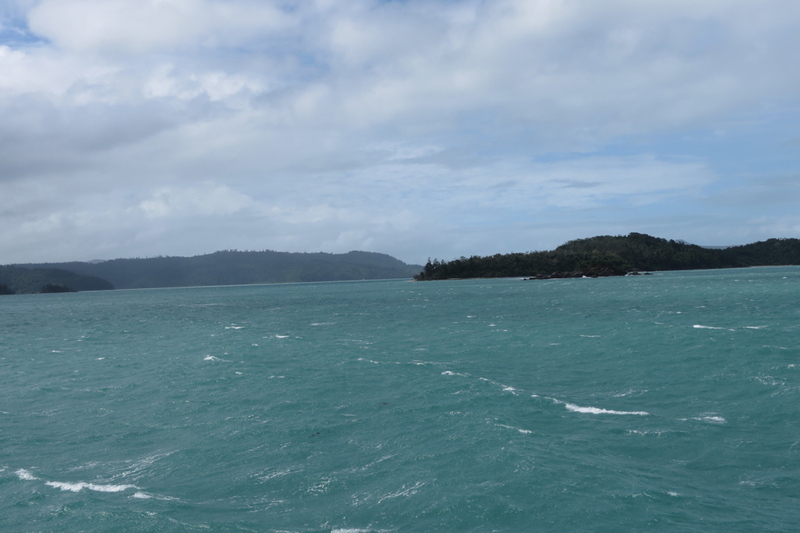 The Whitsunday Islands are a group of islands located off the coast about 900km north of Brisbane. 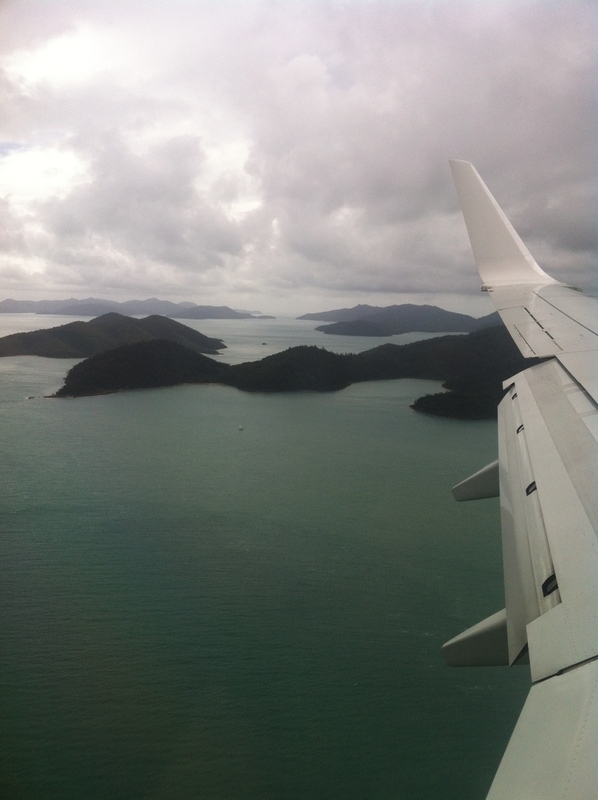 Hamilton Island is the commercial center of the Whitsundays and hosts the only airport which we soon fly in to. We only have about 36hrs to enjoy, so it goes quick. Similar to many vacations, the rain is pouring down when the plane touches the ground. We scramble to the tiny airport lounge with our umbrellas doing little in the storm and wait for our luggage to come off the plane. 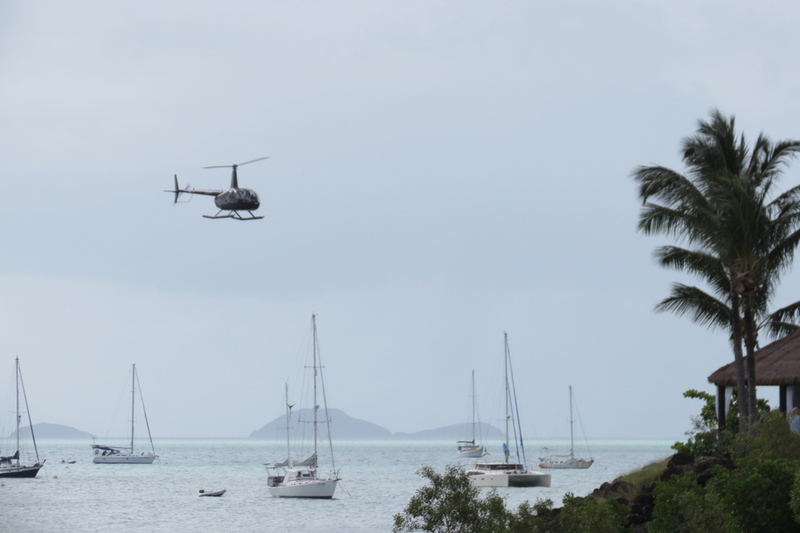 The primary transportation on the island is by golf cart or the public bus that circles the main road around. 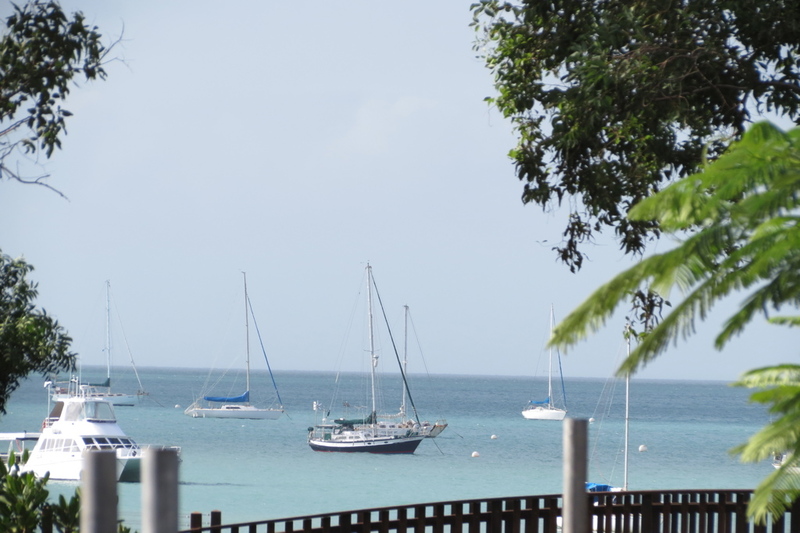 The only other vehicles are a handful of commercial vehicles that service the island and the small port. Soaked from the rain, we still opt for the public bus and take a short ride to our hotel. 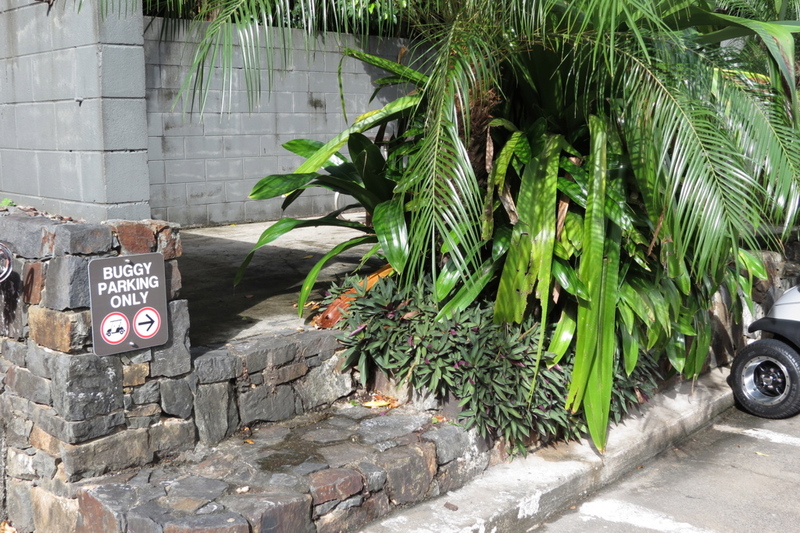 We had previously booked the Palm Bungalows for our one night and were excited to have the private space. 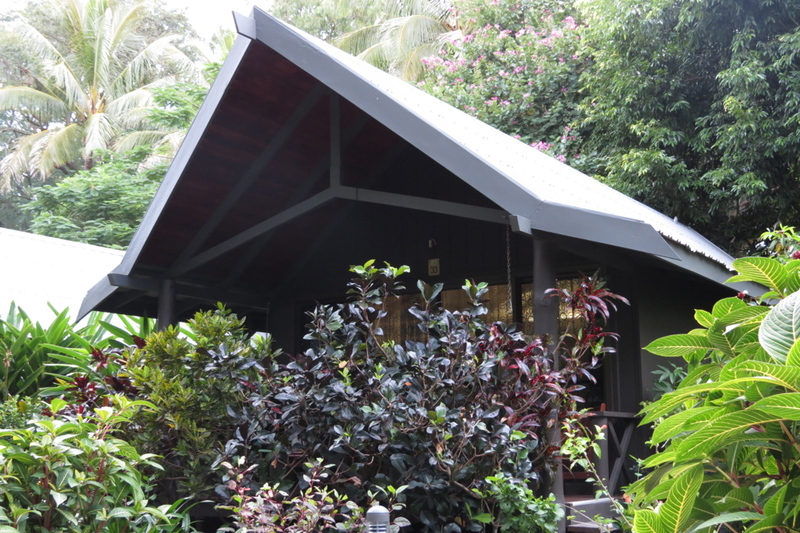 The rain subsides as we get checked-in and it soon becomes a peaceful afternoon after all. 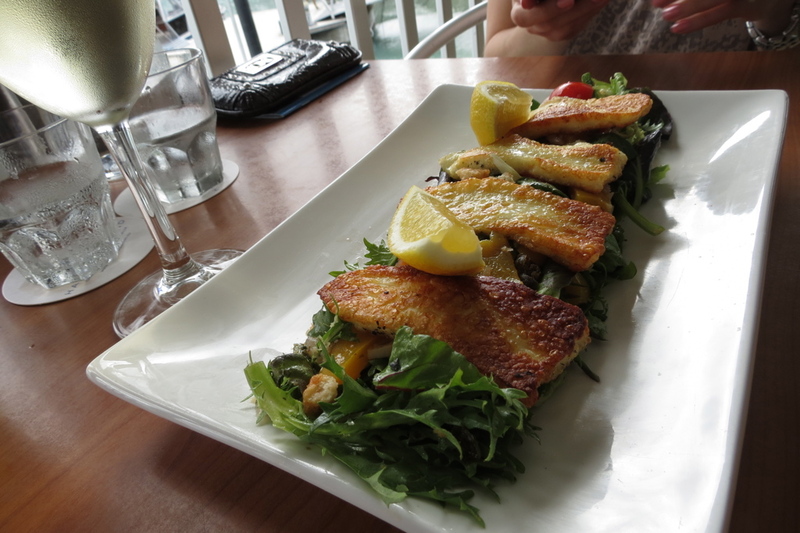 We walk to the port for some lunch and relax on the deck looking out over the docks. 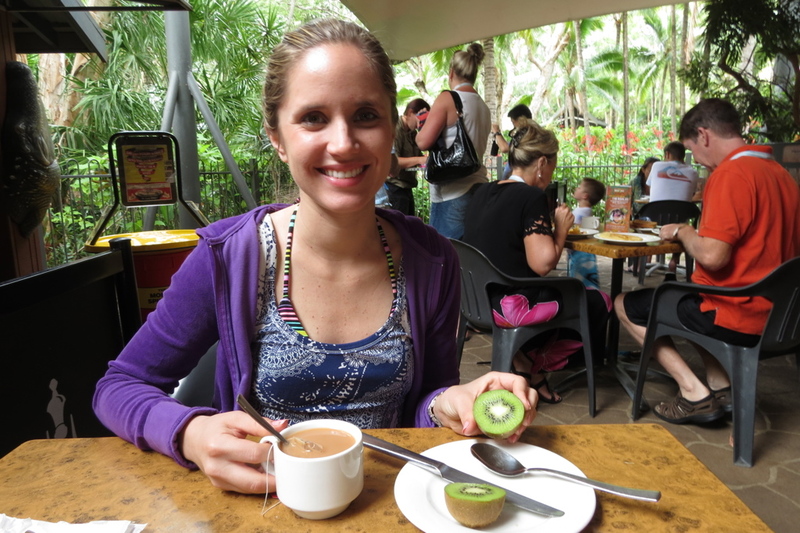 We grab a few things at the nearby market and head back to the bungalow for a little time on the beach. 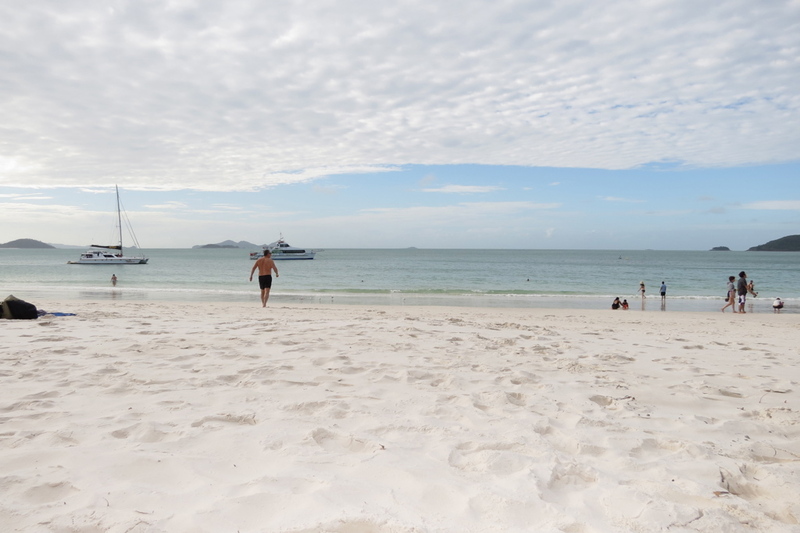 Its low tide at the time so the beach and rocks are more exposed as we wander out on to the sand bar. We spend only a couple hours until the rain begins to roll in again, so it’s back to the bungalow for the rest of the night aside from a quick escape to grab a burger. 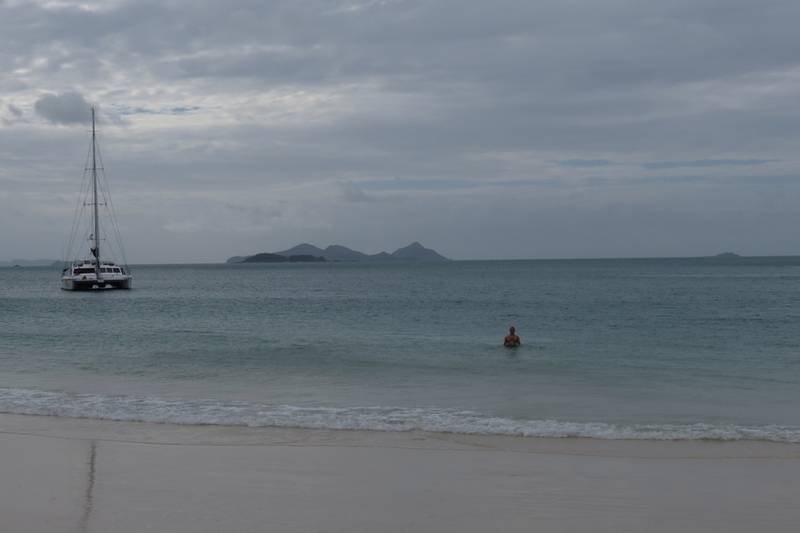 We wake up early excited for our planned trip to Whitehaven beach and have been praying for clear skies…but it’s not looking promising. 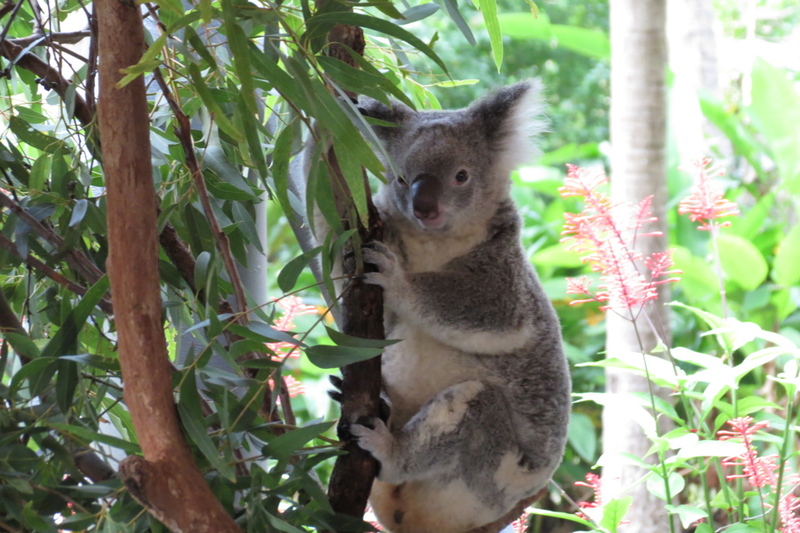 We make our first stop at the WILD LIFE Center to have breakfast with the Koalas followed by a quick walk through the small animal sanctuary. 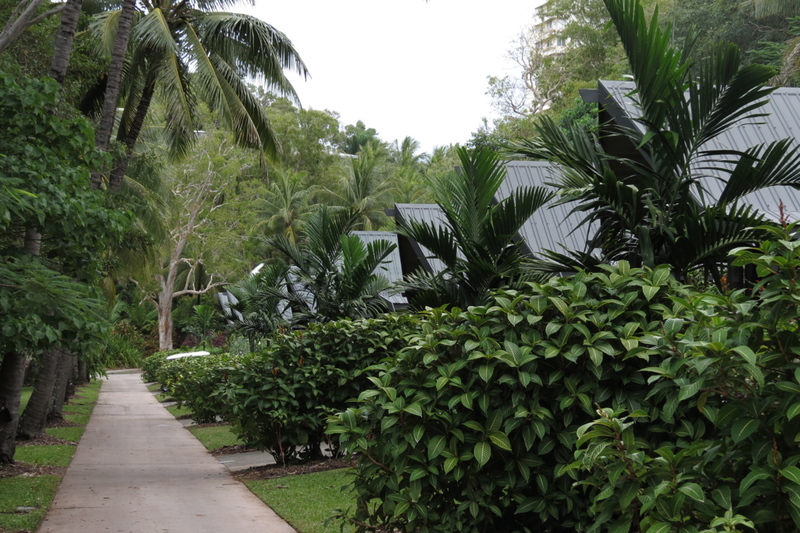 We walk back to the bungalow grab our things and check out. We slowly roll our bags to port and board the boat to Whitehaven Beach…We don’t want to pay for a ferry ride to Airlie beach, so instead we take our luggage on the boat (the cost of the boat is included in our pre-paid Whitehaven beach tour) and plan to disembark at the Airlie beach stop. No one seemed to mind as we board, but we do get a few strange looks from other passengers as we take up a couple extra seats. 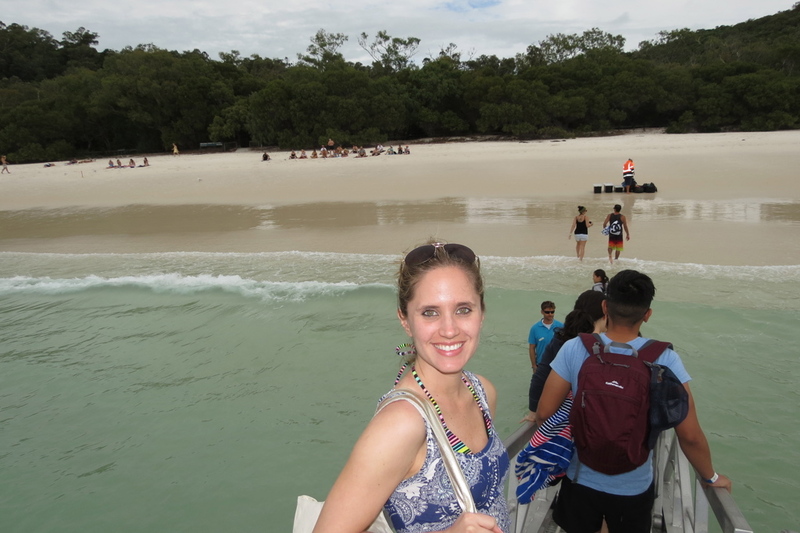 Anyway, it’s a nice boat ride out to Whitehaven beach, a few waves rocking the boat but otherwise a smooth ride. 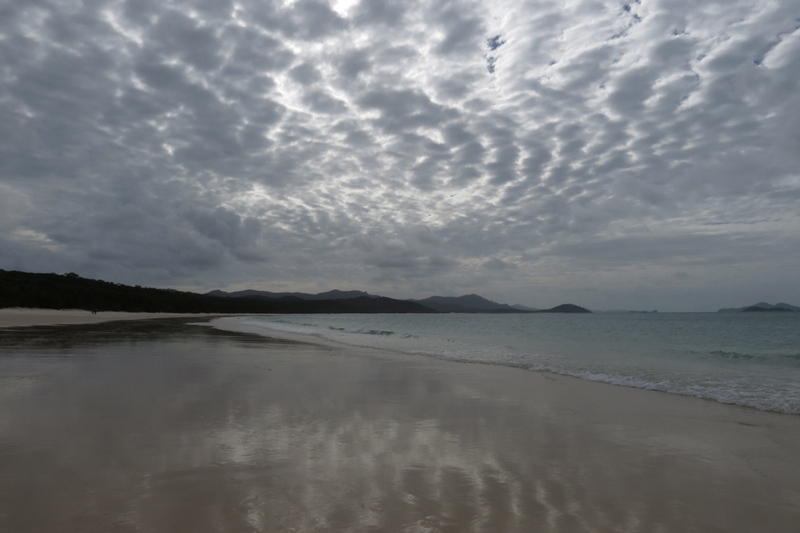 The skies remain overcast for most of the day, but the beauty of this beach is still unbelievable. The pictures do little here, but the thought of seeing this on a sunny day would be incredible. The calm and warm ocean waters could only be better if the sun was shining bright. We eventually board the boat and take the long cruise to home. 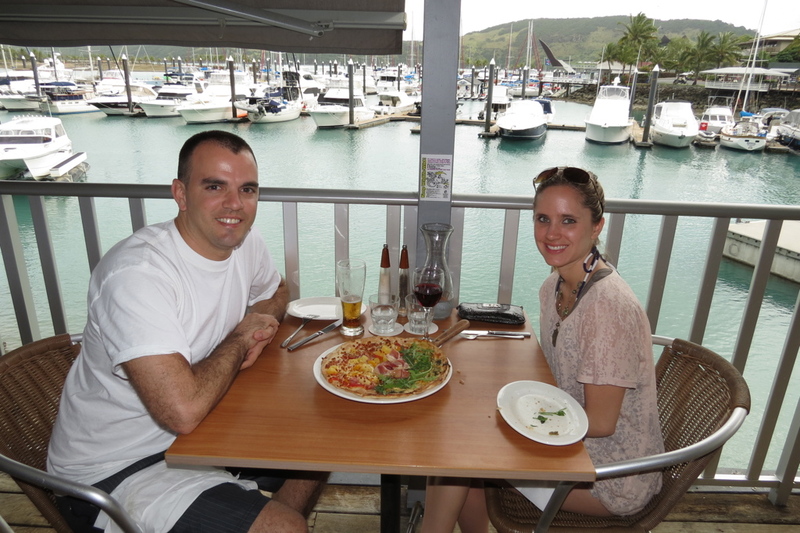 We get off at the Airlie beach stop to catch a bus to the Best Western. After banging on the reception door the “live-in super” finally opens up and checks us in. 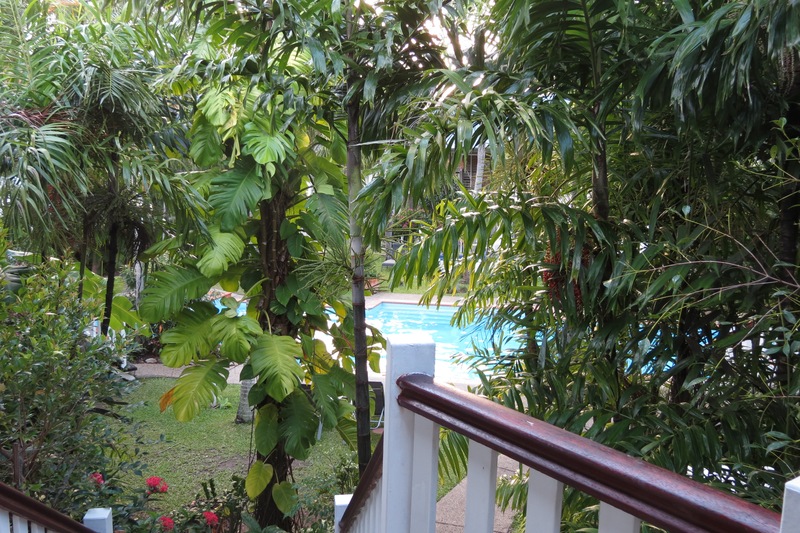 We settle in to our room and then head out to meet a friend of a friend at a restaurant and bar. 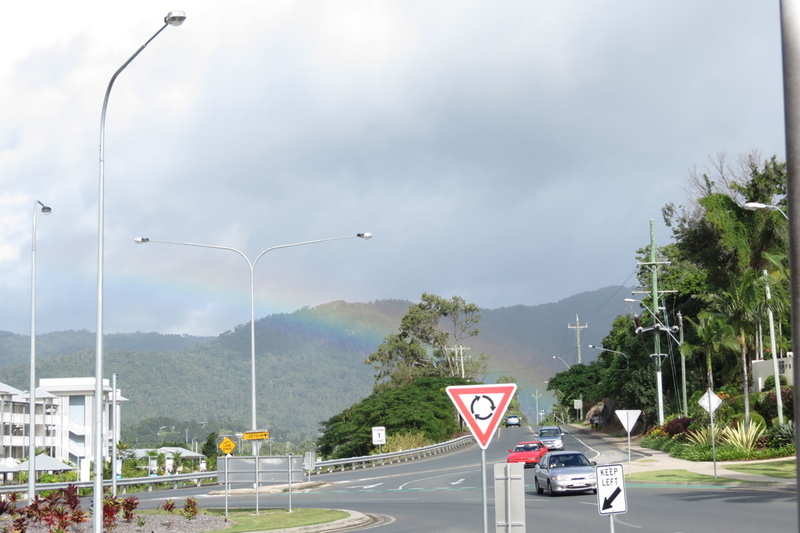 Airlie is a town for backpackers, with hostels and bars clustered in a small downtown area. 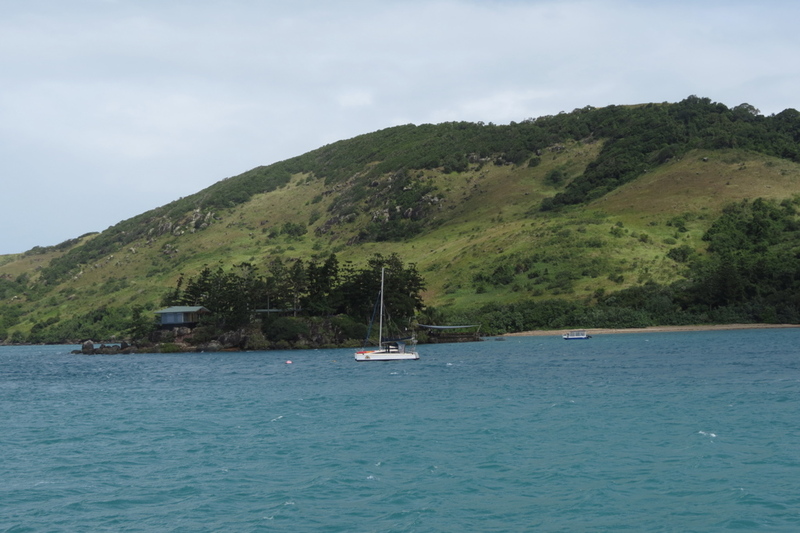 It is one of many departure points to the Great Barrier Reef, which is what brought us here. We spend a couple hours out with our new friends before calling it a night. Early the next morning, about the time the sun is coming up we slip into a cab to take us to the Port of Airlie for an 8:00am departure. 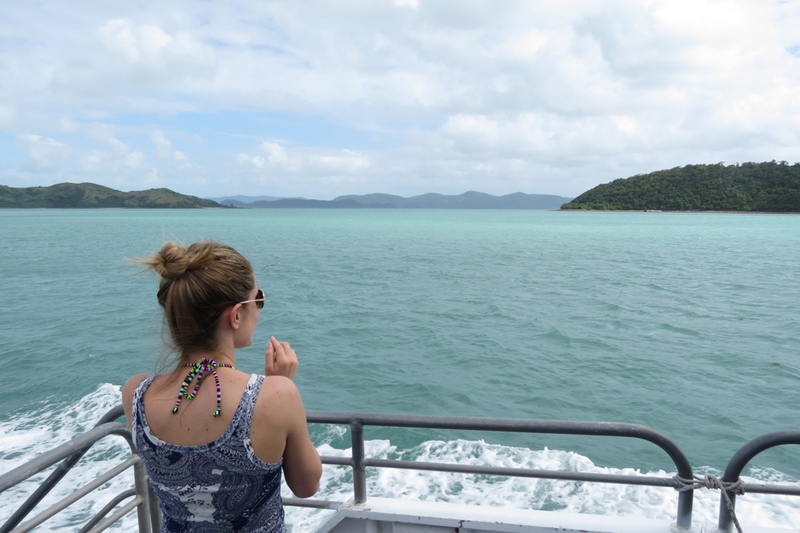 We arranged for a full day Great Barrier Reef cruise through Cruise Whitsundays. 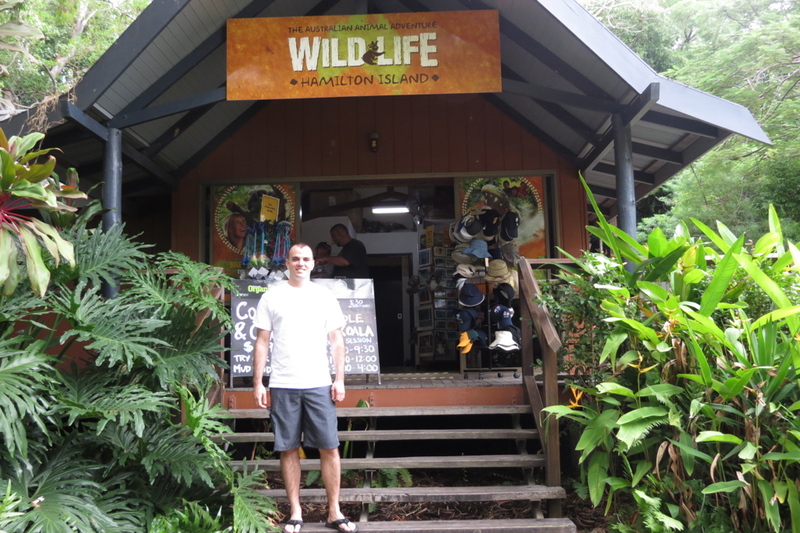 (This company sort of has a monopoly on the tours and ferry service throughout this area of Australia). 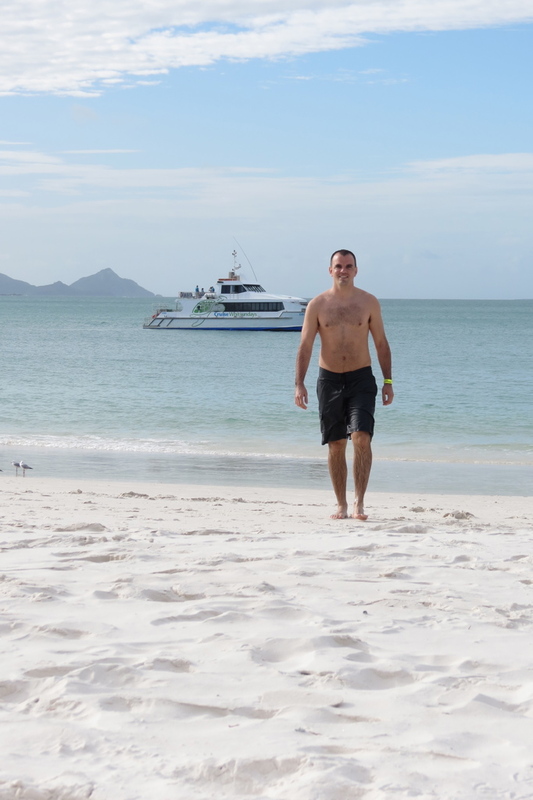 The cruise will take us between the gorgeous islands that make up the Whitsunday Islands and out to a set of pontoons with a restaurant, diving shop, plenty of snorkeling and swimming. 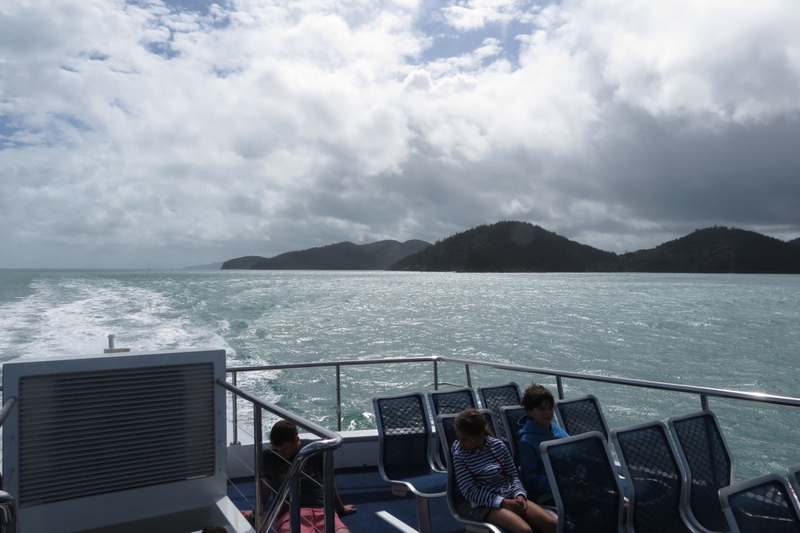 We are very excited to get out to sea and are ready for a full day on the Great Barrier Reef. 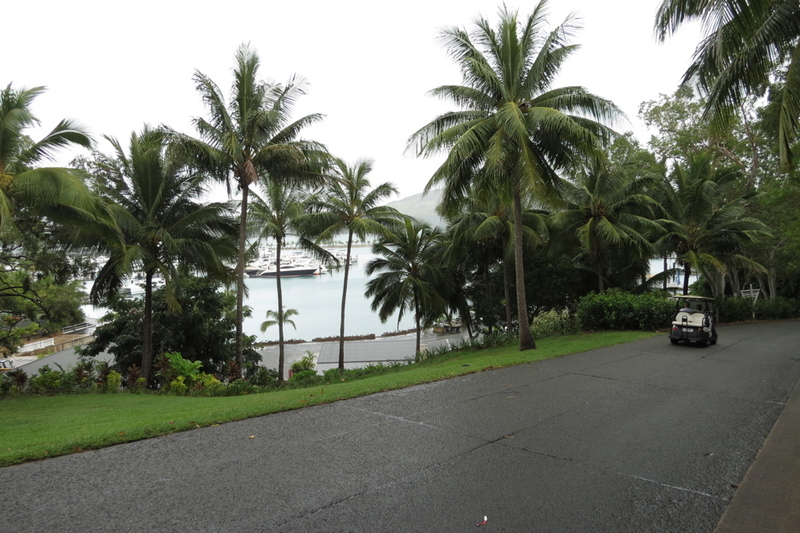 The weather is a little drizzly at the time we get to the port, but it is expected to clear up in the next couple hours. We are approached by different crew members prior to boarding, as soon as we board, and then again once we are seated. Each time, we are encouraged to take the sea-sick tablet and given a description of the entire boat full of people vomiting during the cruise the day before. Once I was told the third time, I assumed it was a message from God and said “I think we will take the tablet.” Needless to say they were right; we cruise through the calm waters and the waves become larger and larger. I see a few people enjoying the “zero gravity” between swells and soon I see the color change on their faces until one by one they are moved to the back of the boat and given their individual “doggy bags.” We are so thankful to have taken the tablet!! 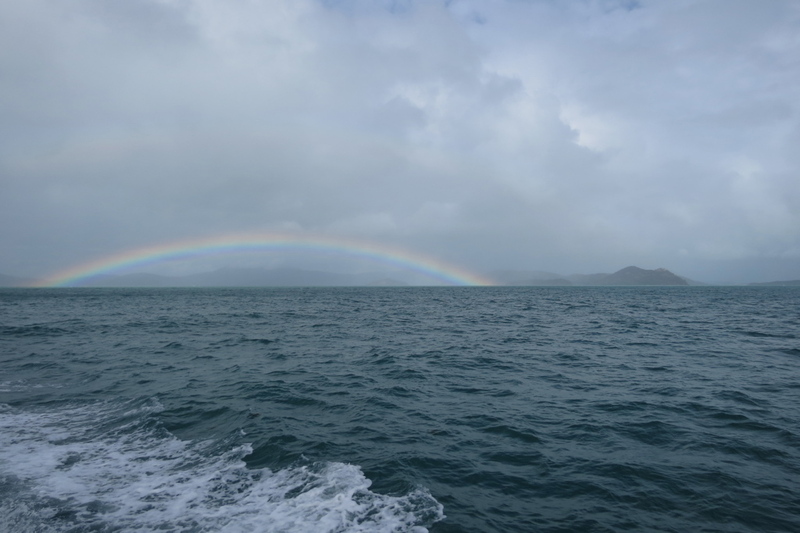 About two-thirds of the way out to the reef, the captain comes over the intercom and says, “I am sorry, but we must turn around.” He lets us know that we are nearing an area in which the passage narrows and the waves are even larger, which will not allow us to pass safely. Within a few minutes of turning around our ship does a nose-dive into an enormous wave and brings the bow of our boat under at least 6 feet of water. The water begins to pour through the doors at the side of the enclosed cabin, the crew rushes us all toward the back of the boat to hopefully lift the front of the boat back out of the water. It was quite a dramatic and even scary scene, but we now agree that turning around was absolutely the best thing to do. Eventually we make it back to shore and now have the rest of the afternoon free. 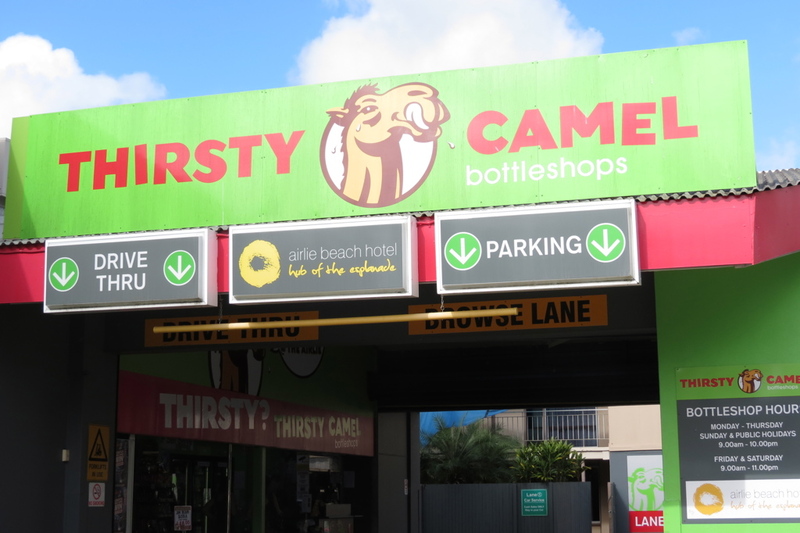 We have lunch at a small restaurant on the main strip then stop at a backpacker bar and share a few drinks in the sun. 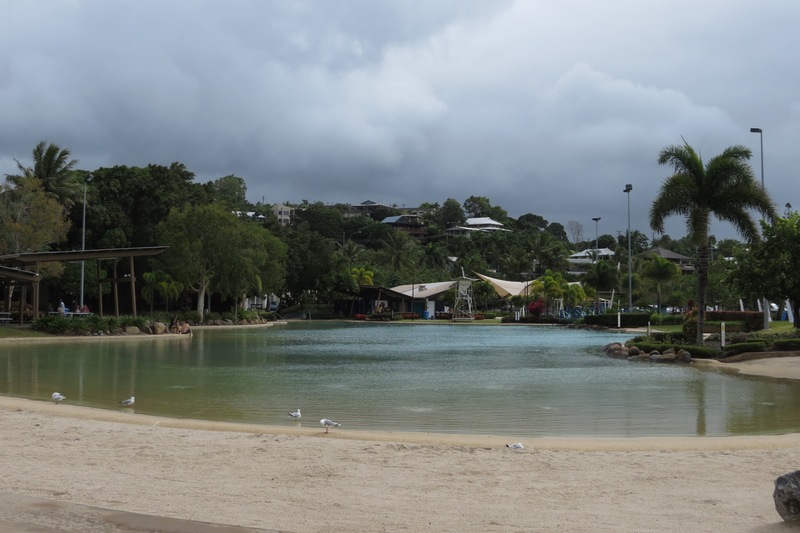 We consider a dip in the Airlie beach lagoon, but the box jellyfish are everywhere and would rather not be stung. That night we meet the same group of friends from the night before. Our same friend Mike invites us over for dinner as a few travelers from Switzerland and Germany are staying with him. It was an interesting night with an interesting mix of people and an equally interesting dinner of Spaetzle made by our new Swiss German friends…I think this was their way of paying Mike for the room. We eventually head home, sleep in a little while, before catching the next flight with EasyJet to Brisbane to meet our friend Prue. 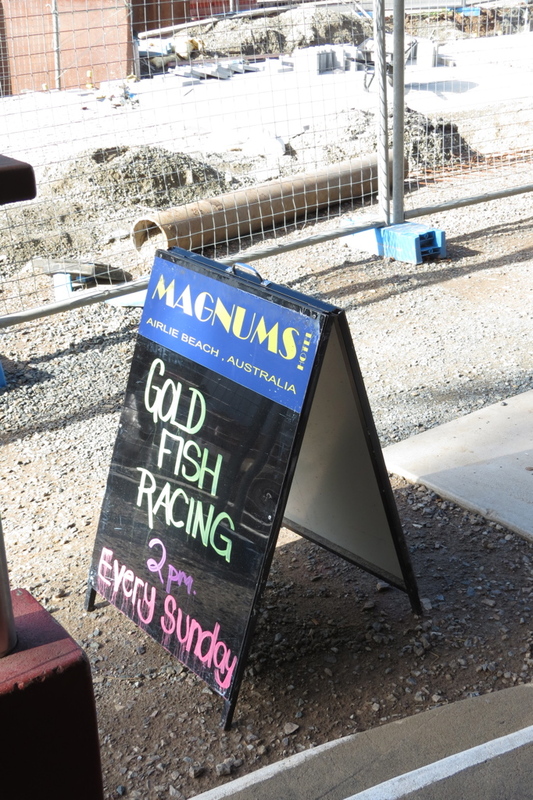 We continue our fast paced adventure through Australia and vow to return to the Great Barrier Reef again one day. Our Three Days in the Amalfi Coast, a Must See in Southern Italy!